In the currency markets, the euro could not break out of its range yesterday, ignoring the mixture of bullish and bearish pulls that were seen during the trading session. By the close of business, EUR/USD was sitting pretty near the starting line. It appears that whilst the Eurozone crisis isn't being spread across the headlines on a daily basis, that doesn't mean caution has been binned by currency traders. In the forex spread trading markets, the EUR/USD pair did edge lower yesterday, but closed the session well off its lows. Selling pressure initially came from reports that Angela Merkel was unsure of whether the 'European project' would last, sending the euro as low as $1.2215. However, the euro rebounded as the statements were put into the correct context, and the pair settled at $1.2282, a mere 8 points lower than the previous day. This morning, the single currency has moved above the $1.2300 level, which is where it's sitting at the time of writing. 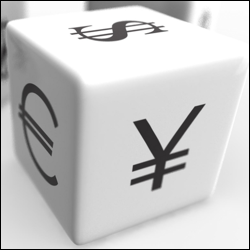 In forex trading, the euro managed to eke out some small gains yesterday, after seeing a sharp reversal of sentiment. Bernanke's lack of enthusiasm for QE3 initially saw the dollar strengthen, pushing the euro as low as $1.2188, just avoiding a test of the 2 year low at $1.2162. The low at $1.2162 now seems to be turning into a solid support level for the single currency. Financial spread trading investors will be looking for the pair to consolidate in this region before testing the resistances above. After yesterday's see-saw session, the EUR/USD pair is at $1.2280 this morning. Near-term support and resistance is seen at $1.2215 and $1.2175, and $1.2315 and $1.2335 respectively. The euro failed to make a new 2 year low yesterday, despite the bears' best efforts, and actually managed to pare initial losses and add modest gains. The reversal in sentiment was spurred by dollar weakness, as poor US retail sales data got the rumour mills turning for an imminent round of QE3 from the Fed. This gave some support to the single currency, which has filtered through into today, with the euro/dollar pair currently back at $1.2300. The arch-bears will be saying that this is a good selling opportunity but few will want to commit to further shorts if this squeeze continues. The euro saw another 2 year low on Friday, hitting $1.2163, but the bears were quickly swept aside in the afternoon as the single currency bounced up to a close of $1.2247. The reversal in sentiment was triggered by a successful Italian bond auction, and the general risk-on mood in the CFD trading markets added to the upward momentum. This morning, EUR/USD is at $1.2235 and isn't showing any huge indications of wanting to keep moving higher. Having said that, Friday's rally could be just the start of a larger bear squeeze. In the FX markets, the euro/dollar pair reached another 2 year low yesterday, touching $1.2166 before rebounding. The euro continues to be weighed down by the steady upwards march of Italian and Spanish bond yields. General weakness in sentiment also pushed money into the dollar, further depressing the euro. Whilst we've seen a small bounce to $1.2190 this morning, the downward trend remains very much intact and there seems to be little going for the single currency. In the FX markets, the EUR/USD made another new two year low yesterday, hitting $1.2212. This came after the FOMC minutes, as the Fed failed to deliver any suggestion of QE3. With the single currency still mired in a debt crisis, and the dollar buoyed by the lack of a fresh round of printing, it looks as though the bears are still firmly in control. As a result, it seems highly probable that we will see another 2 year low during today's session. At the time of writing, the bears continue to keep the bulls at bay with EUR/USD at $1.2220. The weakness of the euro has given sterling a boost, much to the annoyance of UK exporters. In fact, the GBP/EUR forex market touched €1.2700 yesterday, a level not seen for three and a half years. Following a doji candlestick formation on the daily chart, the technical analysts are pushing sterling lower and so we are currently trading at €1.2650. The euro made a new 2 year low yesterday, touching $1.2234 against the dollar, on concerns that the ESM fund may have hit a road block in the German courts. This has cast some doubt on the already agreed bailouts. Although the pair has made back some ground, it seems unlikely that we will see any positive cues today, and so sentiment will remain heavily bearish. This morning, however, a few investors are trying to pick the bottom and some opportunistic buying has helped the EUR/USD pair move up to $1.2275. In the currency spread trading markets, the euro seems to have found some support around the $1.2250-$1.2300 level but is hovering tentatively above its multi-year low. With the pair at $1.2290 at the time of writing, FX traders will be watching the German vote more keenly than most, just in case the unexpected happens. There is still plenty of negativity surrounding the single currency. Eurozone employment figures, industrial and manufacturing data, and retail sales are all continuing to head lower. There is also a very real chance that we will see further rate cuts from the ECB. On the economic data front, apart from the Chinese inflation data that we've had this morning, there's little else to report on. In fact, the rest of the week will also be relatively quiet. The euro is continuing to suffer in the forex markets, and is approaching a fresh two year low against the dollar. The bears will be targeting the big figure of $1.2000 and, with the way things seem to be trending for the single currency, it may not be long before we see a test of that level. There's been very little positive news for the euro of late, and the prospect of further interest rate cuts from the ECB is only adding to the bears' argument. At the time of writing, the EUR/USD pair is at $1.2295.